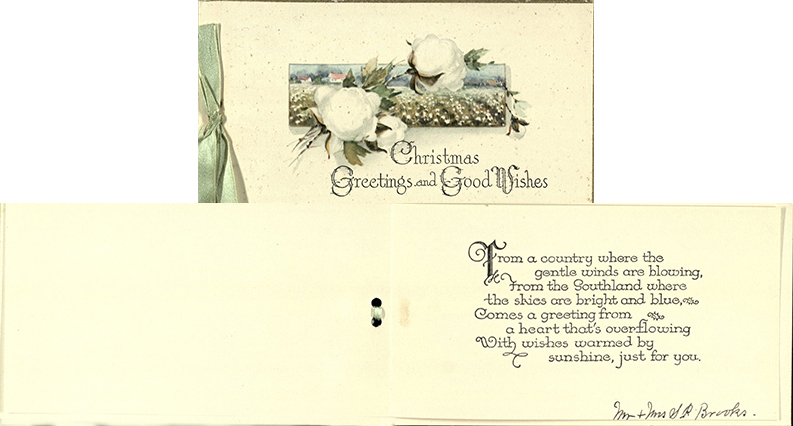 With Christmas around the corner, we thought we’d take a look at how the holiday comes up in our archival collections. The following is just a small sample of Christmas-related photos, programming, and other documents that can be found at The Texas Collection on the most wonderful time of the year. 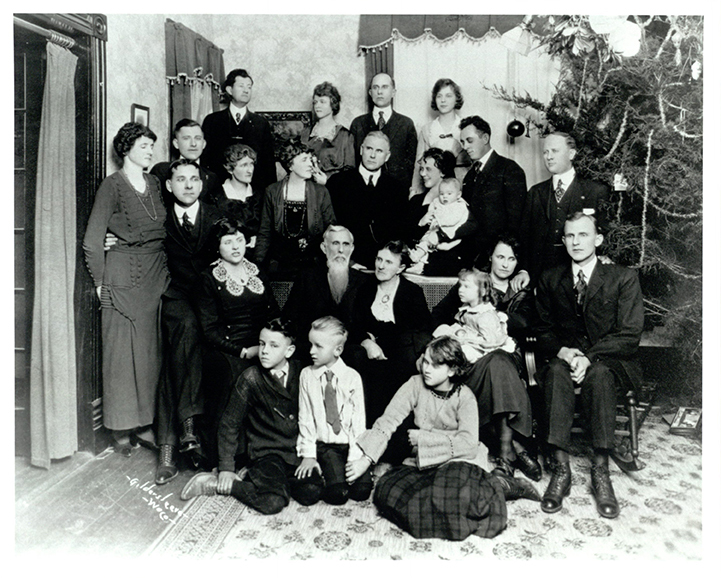 George W. Truett (middle, 2nd row from the back) and family at Christmas in Waco, c. 1890s. Apparently, the challenge of getting a good family Christmas photo is not a new one–hardly anyone is looking at the camera here! BU records: George W. Truett Theological Seminary #BU/298, box 3, folder 15. Christmas card, Mr. and Mrs. Samuel Palmer Brooks to Dorothy Scarborough, c. 1931. Baylor President Brooks extended Yuletide greetings and a taste of Texas home to Baylor alumna and former faculty Scarborough, who was at this point teaching at Columbia University in New York. There are Christmas cards aplenty in Scarborough’s (and other) collections. Dorothy Scarborough papers, Series I, box 13, folder 4. Waco Caritas Christmas party, 1980. Caritas staff gather for a photo at a Christmas party. Again, the challenge of the group photo–there’s always someone whose eyes close. [Waco] Caritas records #2891, box 5, folder 15. Christmas program (piano copy) at Brook Avenue/Bethel Baptist Church, undated. Finding new and engaging ways to lead a church in its celebration of Christmas always is a challenge for ministers–this piece was found in a folder full of clippings for various Christmas ideas and activities. (Pre-Pinterest, you know.) Telling the Christmas story through Bible verses and beloved carols is a must, though. [Waco] Brook Avenue and Bethel Baptist Church records, box 3, folder 12. 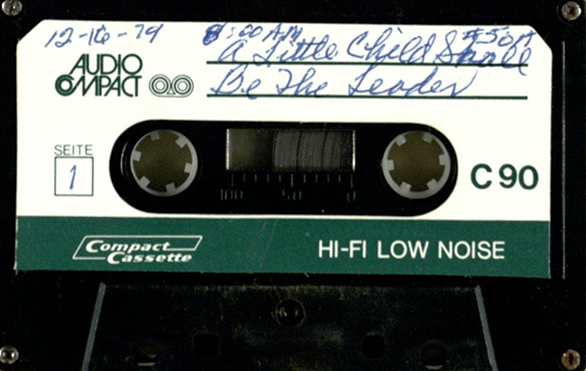 “A Little Child Shall Be the Leader” sermon by Marvin Griffin on audiocassette, 1979 December 16. Rev. Griffin was preaching at Ebenezer Baptist Church in Austin at this point in his career. 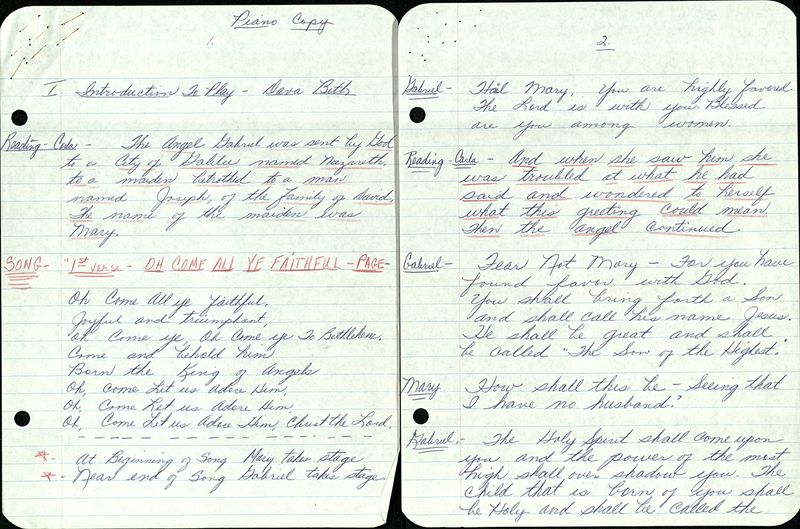 His collection includes hundreds of recordings of his sermons and radio broadcasts. Happy New Year (and new century!) from Chas. 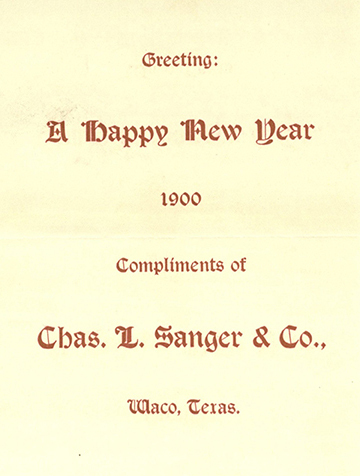 L. Sanger & Co., a cotton buyer/shipper company. Barnard-Lane collection #39, box 5, folder 14.